I can’t get enough of these microwave mug cakes at the moment, which isn’t ideal because my plan to walk everyday went out the window last week when I pinched a nerve in my back, but on these cold Winter evenings nothing is more comforting than curling up on the couch with a warm cup of cake! 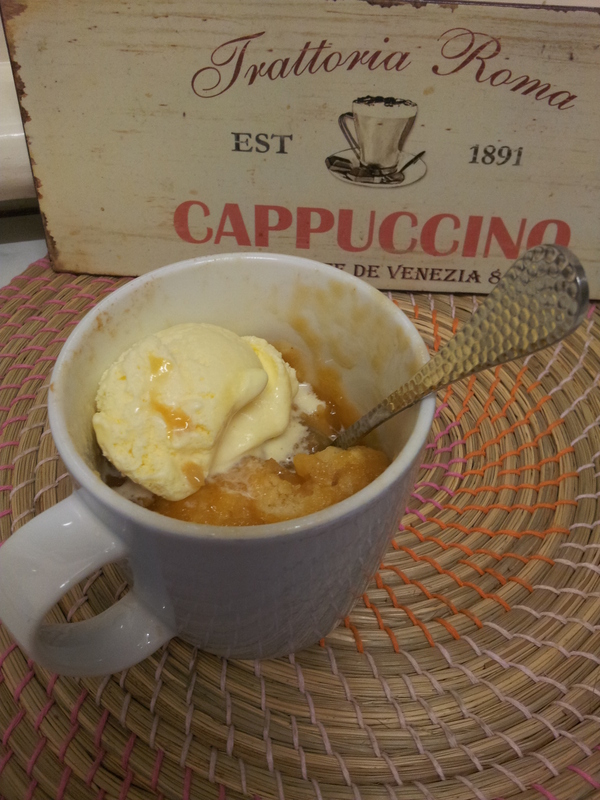 Here is my latest offering – a deliciously moist and caramely butterscotch pudding that’s ready in under five minutes. Microwave milk and butter in mug for about 30 seconds or until butter is mostly melted. Add half the brown sugar and microwave again for about 15 seconds then stir until the sugar has dissolved. Mix in the honey and self raising flour until the batter is smooth. Sprinkle the remaining brown sugar and cinnamon over the batter then gently pour the hot water on top. Microwave on high for 60-75 seconds until spongey on top and saucy underneath, then stand for 1-2 minutes. Serve with a dollop of cream or ice-cream. Little Chop’s asleep, hubby’s away, Masterchef is on and this Mama’s got a craving for chocolate pudding! Place the butter and milk in the mug and microwave for 30 seconds or until butter is mostly melted. Stir in the castor sugar, self raising flour and half the cocoa powder. Sprinkle the remaining cocoa powder and the brown sugar over the top of the batter. Gently pour over the boiling water. Microwave on high for 1 minute, then let stand for 1 minute. Top with thick cream or ice-cream and devour. *You can add a pinch of nutmeg or cinnamon, or 1/4 tsp of instant coffee if you like to spice things up.